I discovered this quaint restaurant during one of our visits to Laman Padi. It's located at the northern side of Pantai Cenang and in the compound of Laman Padi rice museum. It doesn't appear like a typical restaurant. You will feel as though you have come to another facility of Laman Padi when you see this roof covered but open spacious place. But after you notice the few tables laid out with good space between them and see Mari, the Japanese lady hostess approaching you with a smile and a menu card in her hand, then you know that this is actually a restaurant. It's run by a Japanese couple Mari and Miki who take a lot of passion in cooking authentic Japanese cuisine and other dishes, as well as caring for the guests. Mari is the Chef herself. 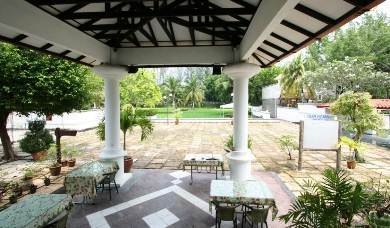 The restaurant is nestled within lots of greenery around with views of the paddy fields and herbal gardens. It's difficult to imagine that in a highly touristy place like Pantai Cenang, there is still such a wonderful serene ambience available for a quiet relaxing meal. And the best part is, not many tourists know about this because you won't find any boards outside the Laman Padi complex. As a result, Laman Ria Restaurant is never crowded. Most who come here are returning guests or those who found it by chance like us. This restaurant is excellent for families as well. When we walked in, Mari handed over a Japanese menu card and another one having plenty of Malay as well as Chinese and even Thai dishes. She also gives a couple of picture books full with picture of her food preparations. Every time thereafter we went to this restaurant, we had always found her with a refreshing smiling face. There are plenty of items in the menu. If you can't decide what to order, a good selection would be Mari's Platter - It's a selection of items from the Chef herself and is excellent. But Mari is always there to help you understand the items, how they are cooked so that you can order something which you will really like to have. One of our favorites here is the Chili Tiger Prawns - one of the best I've ever had in the island. In Japanese try out the salmon and avocado sushi, it's excellent. They make authentic and traditional Japanese dishes. Other great dishes that we tried here and really enjoyed includes cashew chicken, sweet & sour chicken (chicken cooked perfectly), soft shell crabs, Laman Ria Prawns, Kankong Sambal (fish item), fish prepared in Thai style etc. And the best part is the food is very reasonably priced and cheaper compared to many other restaurants on the street. There are lots of items in Chinese. This is one place where you will get Steam Boat. Meat, vegetables and seafood will be cooked in a soup right on your table. If you savor exotic Asian food, you will be pleasantly surprised that Laman Ria serves soups with shark and sea cucumber. Total seating capacity in Laman Ria is about 80. Other than open seating under covered roof, there is also inside seating. The entrees start from RM6, main courses in chicken from RM14, fish & seafood from RM12 and beef from RM16. They offer cooking classes for Thai, Malay and Japanese cuisine for both individuals, couples and groups. It's a fun way of learning how to cook such great dishes and giving a new dimension to your vacation while taking back home some great knowledge and skills that you will cherish for ever. Professional chefs run the cooking classes and each class has three kinds of menus. After the class, you will relish the food you prepared. If you are interested, then you should book a class in advance by writing to Mari (email address given below under contacts). There is ample car parking in the restaurant premises. They serve lunch and dinner. Open from 12noon to 10pm (Friday closed). You can walk in or make table reservations. Laman Ria Restaurant is located in the grounds of Laman Padi Rice Museum in Pantai Cenang and opposite to the Meritus Pelangi Hotel.